I love lists, spreadsheets, and measurable targets... I'm currently mending/donating/organising/throwing out 100 items a day! On Saturday I said goodbye to spices which expired in 2007, and I'm about to take down my 2010 calendar. I made this list this morning, and I've almost finished everything. How do you keep organised? Funny how an image like this immediately makes me want a cup of tea (and it's bedtime!). Lists, phone diary, work calendar, etc. But most of all, a tiny notebook that I carry everywhere with me with a long-running 'to do' list and a tick next to each one as they are done. Works for me. Sigh - I really do need to start making lists. The great thing about lists is that the act of list writing makes you feel organised on days when you really don't feel like getting round to actually doing any of the things that are on the list! 100 items a day!? I am about to start a big getting rid of clutter project - what are your tips? I make lists in my head, I have a notebook which is never used! I need to start writing things down!! Yes, I've got tons of lists that just get discarded! Love a list. 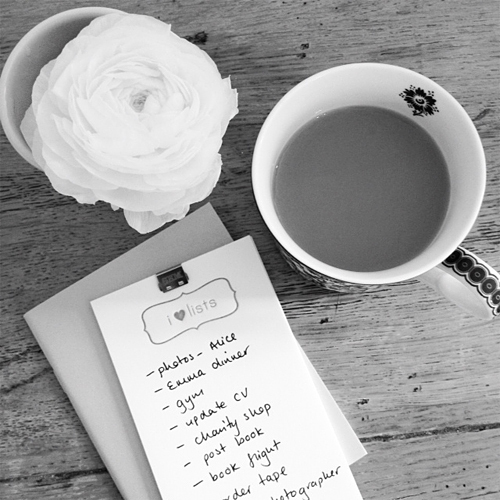 Love writing them, following them, ticking them off, writing them for others to follow, looking back at all the scratched off items, adding to them and scrunching them up when done... yep... love me a list! Lists, it's all about lists. I've got my diary with all my previous lists in, I can keep rolling on. Also I'm trying to get rid of 10% of my possessions this year. It's so hard!